For those of you who have not yet heard, science fiction Grand Master Harry Harrison passed away yesterday, from causes that are not yet determined as far as I know. Here’s the announcement from his own Web site; here’s an i09 article on the subject. Those folks outside of science fiction circles probably know him best as the author of Make Room! 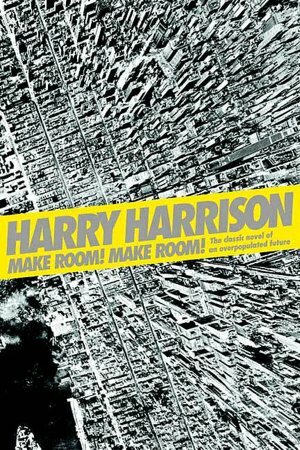 Make Room!, which was the basis of the classic science fiction film Soylent Green. Those inside science fiction arguably know him best for his sardonic and comic Stainless Steel Rat series of books. However you know of him, it’s a loss for the genre: Harrison had his own voice and his own style. SFWA doesn’t give out Grand Master status just for kicks and giggles; you better believe Harrison’s work earned that title. Many other people who knew him far better than I did will say much more significant things about him than I will, but I still have a story about him, which is that he was the first science fiction writer I ever had a peer-t0-peer conversation with. It took place at Torcon 3, the 2003 Worldcon, which was the very first science fiction convention I ever attended. One of the first things I did when I arrived was to make a beeline to the SFWA Suite, which is a place for SFWA members to hang out and socialize and maybe have a snack. Well, I was a brand-spanking new SFWA member (as soon as I got my Old Man’s War contract from Tor, I faxed a copy to SFWA so I could prove I was eligible to be a member), so I wanted to meet my fellow science fiction writers. When I got to the lounge, there was an older fellow sitting at one of the tables by himself, so I sat down and said something along the lines of, Hi, I’m John Scalzi, I’m a new member of SFWA. And he said, hello, I’m Harry Harrison. And I thought, Holy CRAP, because, you know, Harry Harrison. Within a minute of sitting down in the SFWA Suite, I was talking with one of the living legends of the genre. He was gracious enough to give me some of his time and to suffer my interminable rambling, because even though I referred to this as my first peer-t0-peer conversation, come on. 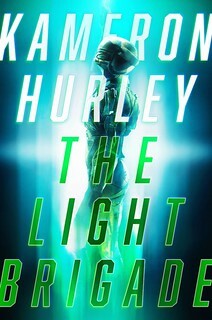 My first novel wouldn’t be released for two years yet; meanwhile Harry Harrison had dozens to his name. The fact he treated me like a peer, however, was something I appreciated and noted well for future reference. Yes, I was a fan of Harry Harrison’s. 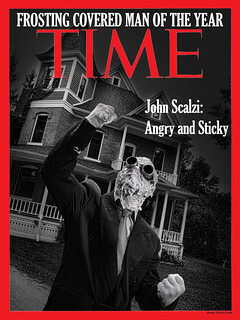 When SFWA named him a Grand Master, I was very well pleased. I think it’s worth noting that in his storied career, Harrison never won a Hugo (he was nominated twice, in the Novel category) and had a share in only a single Nebula (for Soylent Green, adapted from his book). The measure of someone’s influence and stature as a writer is not always immediate; the Grand Master award was a fine way of noting that Harrison’s work and reputation built over an entire career. And that’s an encouraging thing. If you’re a fan or have a memory of the man, Harrison’s official news blog has opened up a comment thread for remembrances and messages of condolences to his family. It’s here. Go on by and pay your respects.